Click here to find out about upcoming live workshops and teleclasses that are open to the general public. When we schedule presentations which are available to the general public, we will send out a notice to our web subscribers so be sure to sign up. Dr. Cline and Lisa Greene are available to present to your organization. They can present together or separately. Dr. Cline, a nationally recognized psychiatrist, is co-founder of the Love and Logic Institute. He is a favorite consultant to psychiatric institutes, schools, and parent groups. His writings are the source of many revolutionary approaches to dealing with childhood problems. Foster is known for his ability to provide creative, effective solutions for behavior problems. His presentations are lively and humorous, while providing practical techniques that produce immediate results. Click here for information about presentations by Dr. Cline. To schedule Dr. Cline to speak, contact Bonnie Burnett at 303-979-7525. As a parent, author and parent coach, Lisa brings fresh insight and personal experience to her classes and presentations. Her classes are fun and life-changing as parents and caregivers enjoy the opportunity to learn new parenting skills and connect with each other. Click here for more information about presentations by Lisa. To inquire about having Lisa speak at your organization, call 425-298-7197 or send Lisa an email. 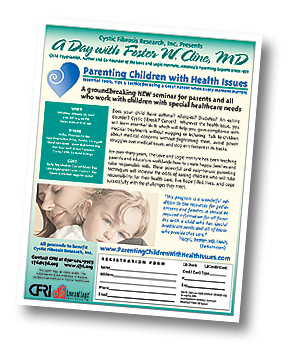 Parenting Children with Health Issues workshops featuring Love and Logic co-founder Foster Cline MD and/ or parent educator Lisa Greene will help you parent or work with children who have chronic health issues. For over thirty years, The Love and Logic Institute has been teaching parents and educators worldwide how to create happy families and raise responsible kids. These powerful and easy-to-use parenting techniques will increase the odds of raising children who will take responsibility for their health care, live hope-filled lives, and cope successfully with the challenges they meet. “This program is a wonderful addition to the resources for pediatricians and families. It should be required information for all families with a child who has special healthcare needs and all of those who provide that care."